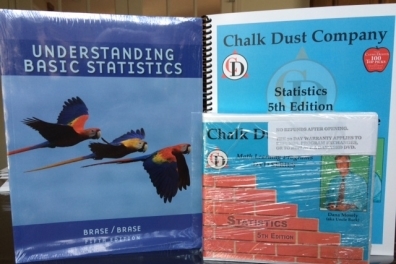 Statistics, 5th Edition, Full Set is 7 DVDs, softbound text, complete solutions guide by Dana Mosely, and technical support. The textbook includes hundreds of real-life application problems that the student will enjoy. Disc 1 - 2 hours 3 min. Disc 2 - 2 hours 8 min. Disc 3 - 2 hours 22 min. Disc 4 - 1 hour 38 min. Disc 6 - 2 hours 9 min. Disc 7 - 2 hours 3 min.